Successfully Added Fingerprint Access Safe - Executive Biometric Security Box to your Shopping Cart. Biometric-safe solution to store and keep your valuables safe from theft and unauthorized individuals. 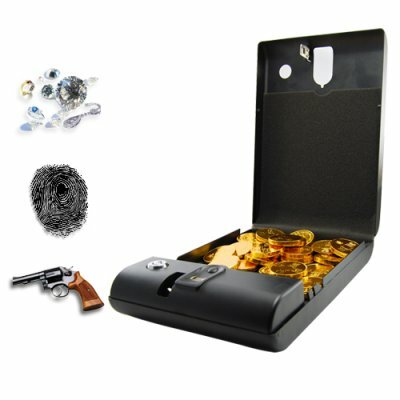 This Biometric storage box is perfect for jewelry, guns, documents, and other valuables. Using fingerprint technology you can now safely store your most important and valued items without worrying about needing keys or combination locks. Simply use your fingerprint to open the executive biometric security box. The CVJR-G89 is built with a thick, high grade 16 gauge cold rolled steel and thick memory retentive foam interior. The biometric fingerprint safe also comes with a high-strength security cable that secures it to furnishings in your home, car, RV, office or motel, giving you double protection. You can also store your portable GPS unit and stereo face plate in the biometric box and secure the biometric box under the seat of your car. So how does this biometric fingerprint security box work? The fingerprint system uses a single finger swipe as its locking mechanism. The safe can handle a maximum of nine fingerprint templates which can come from multiple fingers of a single user or from nine individual people. Additionally, it can utilize a key-lock on the unit which can be used as an additional or alternate security measure. As long as the CVJR-G89 has power and is programmed with a fingerprint then only a registered user can open the box. If there are no registered prints then it can be opened with the key. This a simple but secure way to store your valuables in your car or at home. Mechanism: Fingerprint biometric lock, key lock override, omni-directional spring-loaded door. Yes, both the fingerprint lock and the key lock are equally secure. You can either choose to secure the Bio-metric safe with your fingerprint, key or both for maximum security. Photos & Graphics By: F.Y. on 2011-02-10 02:52:17 Great product!! I have my own business and we have a new office manager, we deal with small bills and to carry a key and have the chance of us losing it scares me. So we got this and you can have several people on it and not worry about losing any key whatsoever, again I say great product!